The last of our reviews of discs from Second Run's The Czechoslovak New Wave: A Collection, Juraj Herz's 1969 THE CREMATOR / SPALOVAC MRTVOL is a dark and brilliant portrayal of one man's descent into occupation-triggered madness. Slarek reviews the film and the DVD. Spalovac microvolt/The Creator is available as a stand-alone DVD from Second Run and as part of a three-film box set titled The Czechoslovak New Wave: A Collection, which also includes Jan Němec’s Diamanté loci/ Diamonds of the Night and Ivan Passer's Intimal lenitive/Intimate Lighting. The three films have been reviewed separately. to God. It helps the Lord to speed man's transformation to dust." If you come to The Cremator [Spalovac microvolt], the 1969 third feature from prolific Czech director Juraj Herz, with little knowledge of its content, characters or setting, then it could take you a while to get your bearings. Following a pre-title trip to the zoo in which we are introduced to lead character Karl Kopfrkingl and his 'decent, perfect family', we join him as he is hosting a sizeable reception, one whose guests are forbidden from smoke and denied alcoholic beverages. "When you die there is no smoking or drinking for all eternity," he tells one of them, as he gently strokes the man's hair and extinguishes his cigar. The event, it turns out, has been organised by Karl to raise customer awareness about the advantages of cremation over burial, a subject he is able to wax lyrical about. There is little indication at this point of when the film is set, and as a key work of the celebrated Czech New Wave, the expectations are that it is taking place in the 1969 equivalent of the here and now. It's only when Karl's former army comrade Reineke starts enthusing about Hitler and his policies and Karl advises his teenage son Mili to brush up on his German that the koruna begins to drop. This is 1939 Prague, shortly before the German occupation, and the country is on the brink of monumental upheaval. Initially this plays as little more than background detail to a portrait of a man with a shared passion for his family and his vocation as a cremator, a process that he believes is not simply about disposing of the remains of the departed, but liberating their souls and bringing an end to their earthly suffering. In the company of the bullish Reineke he initially seems less comfortable, but in the course of their discussions he gradually becomes seduced by the man's propagandist banter, to the point where all other aspects of his life become secondary to this new calling. In many ways Karl is a man with ordinary pleasures and vices, though each are touched with a quaint eccentricity. When he buys a present for his wife, for instance, he selects a framed portrait of Nucaraguan President Emelian Chamorro, while his cheerful visits to a local brothel are confined to the first Thursday of every month. But it's his work at the crematorium that brings him the most satisfaction, a world we are introduced to when he takes new employee Dvorak on a tour of this "temple of death", introducing him to his co-workers and outlining his duties with an unsettling blend of practicality and grimly comic poetry: "These furnaces," he tells Dvorak, "always remind me of the ones in which our daily bread is baked." 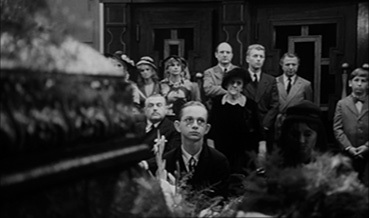 But the most striking aspect of The Cremator is not its characters or the increasingly disturbing direction taken by its narrative, but the sometimes extraordinary nature of its cinematic presentation. A clue to which other Czech filmmaker's work the film feels stylistically wedded is provided by the mere presence of an introduction by the Quay Brothers, and had I not known in advance that the director was Juraj Herz, I could have sworn I was watching an early work by the great Jan Svankmajer. This is firmly established in the opening family trip to the zoo, a disorienting but captivating montage of oddly framed close-ups and rapid-fire editing that feels loaded with hidden meaning and subtextual suggestion. The animated title sequence and lightning-cut montages that follow have Svankmajer written all over them; it should perhaps thus come as no surprise that Herz and Svankmajer were contemporaries who both started out in puppetry and theatre and – unlikely as it may seem – were actually born on the same day. 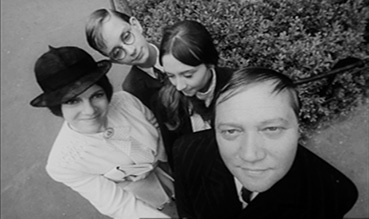 Herz even acted in Svankmajer's 1964 debut film as director, The Last Trick [Poslední trik pana Schwarcewalldea a pana Edgara]. This signature use of extreme close-ups and quick-cut editing peppers the film's first third and is often wittily employed. A Svankmajer-esque fascination with mouths includes a brief but memorable shot of the family cat audibly licking its lips at the prospect of fishy left-overs, while Karl's indecision over where to hang a new picture is visually realised as a series of flash-cuts of him holding it up in various parts of the room. Later the technique is put to more directly political use, as Karl is seduced by Reineke's talk of party meetings and membership, and the pictures of naked women with which he is being tempted are intercut with the more sinister wording of the party membership document he is simultaneously being encouraged to sign. Herz also puts his unique stamp on the look and dramatic flow of the film, not least in the beautifully executed scene transitions, where an action that is seemingly alien to one sequence is more logically concluded in the next, the unbroken flow of dialogue providing an almost invisible bridge. 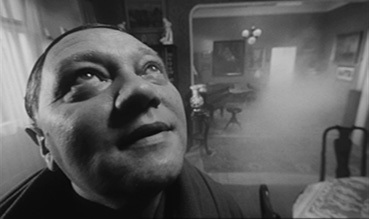 As the film gradually transforms from a layered social drama into a psychological and darkly political horror story, this signature use of close-ups gives way to an unsettling use of extreme wide-angle imagery, an expressionist technique employed to present the action from Karl's increasingly disturbed viewpoint. Crucial to why this works as well as it does is down in part to a beguiling and quietly unsettling lead performance from Rudolph Hrunsínsky, whose intermittently faltering moon-faced friendliness makes his later actions seem all the more appalling. That he gets under your skin from an early stage in spite of his cheery disposition is partly down to the fact that his dialogue sounds more like narration, a close-to-the-mic voice that softly trickles his philosophy directly into our ears. There's also something inherently creepy about his affection for the bodies of the recently departed, whom he treats almost like family, a connection neatly established through his autonomic habit of running a comb through his hair after tenderly doing likewise to a either cadaver or one of his children. As Karl becomes seduced by the dark side, the film moves into more openly metaphorical territory and Karl himself becomes a walking symbol of capitulation, betrayal and the dreadful and destructive nature of Nazi ideology. A second viewing reveals how smartly this downward spiral into murderous madness has been signposted, from the killings being portrayed by waxwork animatronics (actually actors in make-up, giving the show a particularly macabre feel) to the iron bar that Dvorak trips over and Karl asks be replaced because "it may come in useful." Given Karl's profession, there's a terrible inevitability to what his role within the party will eventually be, but even I wasn't prepared for the moment when his fascination with the Tibetan Book of the Dead would install in him the belief that he is the reincarnation of Buddha. 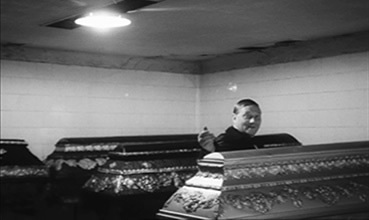 By any measurement, The Cremator is remarkable cinema, a stylistically thrilling work that effortlessly melds narrative, character and socio-political subtext to increasingly disturbing but compelling effect. Even the blackly comic elements are seamlessly blended into the layered whole, typified by the comically bickering couple who disrupt almost every public gathering but whose eventual break-up leaves the abandoned husband in despair, a subtle but poignant reflection of the change that his country is undergoing. In politics, just as in life, you sometimes don't appreciate what you've got until it's gone. In common with just about every Second Run DVD that's landed on my doormat, the transfer here is the result of a new restoration, or new for 2006 when the disc was first released. Of course, even the most careful restoration is at the mercy of the source material, and given the high standard we've come to expect from Second Run discs (check out the lovely image quality on Intimate Lighting from this very same box set) and the care with which their releases are handled, we can assume this is the root of the minor issues here. Don't get me wrong, this is still a very pleasing transfer, with the anamorphic 1.68:1 boasting an attractive tonal range and a relatively clean picture (dust spots remain, but are never excessive), and many of the facial close-ups display an impressive level of detail and are crisply rendered. The wider shots, however, are considerably softer, and fine detail is indistinct, which may well be a by-product of the use of wider lenses and the sometimes difficult shooting conditions (a little ironically, given the background events of the drama, filming was interrupted by the Soviet invasion of Czechoslovakia in August 1968). The Dolby 2.0 mono soundtrack has also been restored, and while displaying an inevitably restricted dynamic range and treble bias, the dialogue, effects and music are always clear and there is almost no trace of background hiss or other issues. The always engaging Quay Brothers (you surely don't need me to explain who they are, do you?) enthuse about the film and tick off nearly all of the points I'd made a note to include in my review, prompting me to consider just posting a transcript of the interview and be done with it. They even manage to top anything I was planning to say by describing the film as "visual and aural morphine" and some of the imagery as "like daggers to the eye." The star of the show here is an essay on the film and director Juraj Herz by Daniel Bird, a consistently interesting piece that manages to be detailed and analytical without disappearing up its own behind. Also on board are credits for the film and three production stills. Another East European treasure revived for our humble appreciation by the fine people at Second Run, The Cremator is a fascinating and essential example of the Czech New Wave at its most adventurous and darkly visionary. The transfer may be some way from pin sharp in places, but it still does the job, and the film is so good you're unlikely to worry. If you've not got around to picking up the 2006 stand-alone disc, then this re-release as part of Second Run's The Czechoslovak New Wave: A Collection box set, which also includes Jan Němec's Démanty noci [Diamonds of the Night] and Ivan Passer's Intimni osvetleni [Intimate Lighting], provides an excellent introduction to the Czech New Wave. Highly recommended.